It doesn’t take a genius to grasp that the American president doesn’t really want to attack Syria. He doesn’t want to topple Assad’s regime – He doesn’t have an alternative partner on the ground. Instead of ‘Shock and Awe’ this time the Pentagon is talking about ‘surgical attack’. The English speaking empire, famous for its destructive inclinations, makes the potential attack on Syria sound like a ‘cosmetic effort’. No one in America, Britain, France or Israel is yet to suggest what is the goal of such an attack. What are the military initiatives? But the most crucial question is what could be the positive outcome of such a military assault? I guess that we have to admit that Obama’s administration is almost as confused as the situation on the ground is. It seems as if in a relatively short time, the American administration has managed to fall into every possible trap. It is now affiliated as well as conflicting with Al-Qaeda (assuming there is such a thing), Wahhabi war-mongers, Salafi terrorists, the Muslim Brotherhood and their enemies – the Arab seculars and nationalist revolutionary forces. America has tried to appease them all, but it obviously failed in every possible front. Dropping bombs on Syria is not going to provide the goods either. 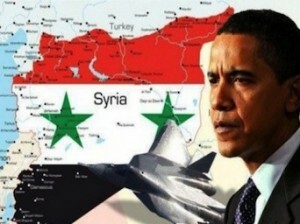 A ‘surgical’ assault on Damascus is not going to appease America’s Wahhabi partners, it may even achieve the opposite. I guess that time is ripe for Obama to re-examine America’s entire interventionist doctrine, but can he? Can an American leader think for himself? Can an American leader think for America? Can an American leader think at all, or is he or her just reacting to Lobby pressure? For more than a while, America’s leadership has been in a clear state of detachment and alienation – instead of looking after America’s national interests, like other Western democracies, it is torn between opposing lobby interests and marginal pressure groups. I guess that no super power can maintain its hegemony under such circumstances. Accordingly, America, in its attempt to appease many conflicting lobbies, conveys a growing hesitance that has led into political impotence and a diplomatic standstill. Yesterday evening, when it looked as if an American attack on Syria was imminent and just a matter of hours away, Britain managed to save the situation – it gave president Obama a rope, it allowed him a bit more time to reconsider his action. It may even be possible that Britain followed Obama’s request. Someone in Britain must have realised that launching a war while the UN team is still investigating, would be hard if not impossible to justify afterwards. Clearly, the timing of the British decision to postpone the attack was crucial, yet, in order to save our civilization, we must form the necessary political instruments that would prevent our politicians from dragging us into foreign conflicts and world wars against our will and without our consent.